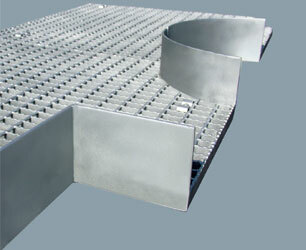 The Shaped grating panels can be cut from standard grating panels and shaped to fit a specific floor area. They can be installed with non-slip edge bars and toe plates. An important aspect here is that all of our shaped gratings are subjected to rigorous end to end check at each stage of manufacture. Based on request, we can also arrange for one of our engineers to visit your site to survey the area to be covered and determine your accurate requirement. We project manage the supply of our gratings to ensure it meets your technical and schedule requirements, for our clients’ satisfaction take priority above everything else. Shaped gratings are designed and manufactured according to the specifications of our clients. Our proficiency extends to the fulfilling of the critical demands of each individual customer. Our engineers plan and design every detail of the gratings such as serrations, round and straight profiles and a lot more after surveying your establishment. Oasis Metal operates with the highest level of skill and technical know- how using the modern and innovative production techniques. We provide shaped gratings in Mild steel or Stainless Steel. One of the most beneficial advantages of gratings is that they provide the same strength and durability even when they are designed in different shapes and size. By installing shaped gratings our clients enjoy, aesthetically designed gratings that are easy to install. Our shaped gratings are also fashioned with a complete set of fixing clips and other required accessories. Shaped gratings panels can be cut and profiled from standard grating panels to fit a specific floor area. They can be fitted with non-slip edge bars and toe plates to suit the customers design. All of our shaped gratings are subjected to stringent inspection at each stage of manufacture. Our engineering department, equipped with the latest AutoCad facilities, can draw shaped gratings to meet your exact requirement. They will assist you in specifying the correct type of grating to suit your application. If required one of our engineers can visit your site to survey the area to be covered and determine your exact requirement. We will also project manage the supply of our gratings to meet your technical and schedule requirements.